This article is a supplemental text and an overview the Danica of all the articles and patterns presented on Rakkenes.com earlier. 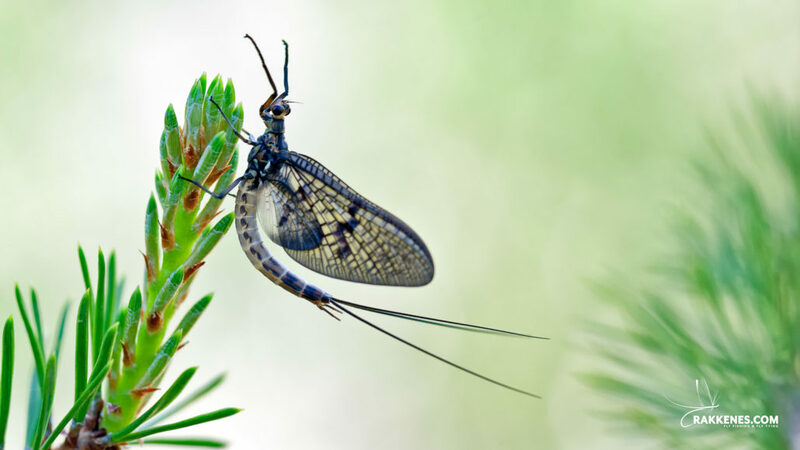 Unlike most other mayflies, the common fly fisher doesn’t have to be an entomologist to recognize the Ephemera Danica. The sheer size of the bird is alone enough to identify it when you see the insect sailing down the streams. In Norway the Ephemera family is only represented by the Vulgata and the Danica. 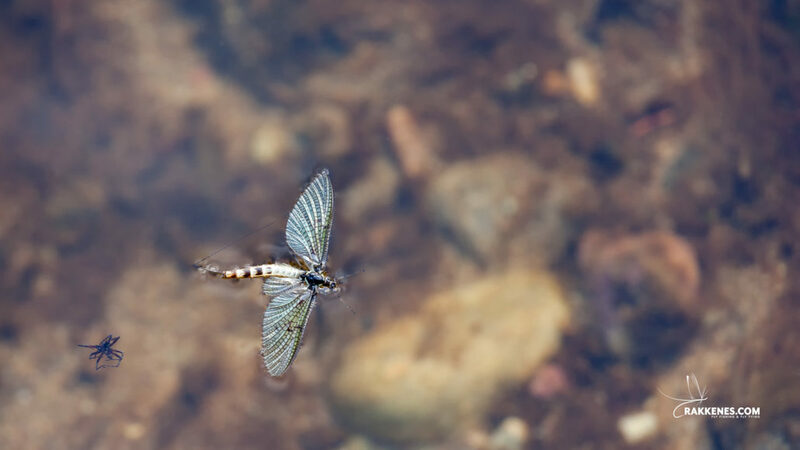 The brown-olive Vulgata only lives in still waters, as opposed to the Danica that usually is found only in running water. 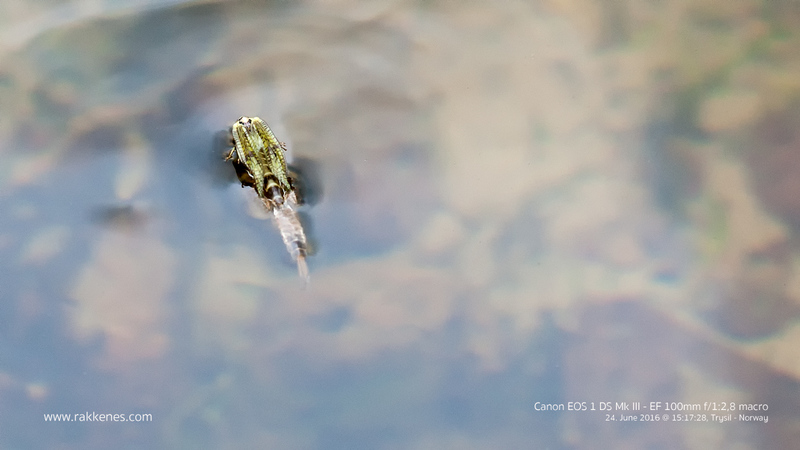 So if you see light olive or creamy one inch (2,5 cm) on the river, you’ll know what you see. The nymphs is a burrower, and lives sub surface for two or three years before she decides to enter the last and most beautiful stage in her life cycle as an imago/sub-imago. Since she is a burrower, it is difficult to fish a Danica nymph. They are really only available to fish twice a year. 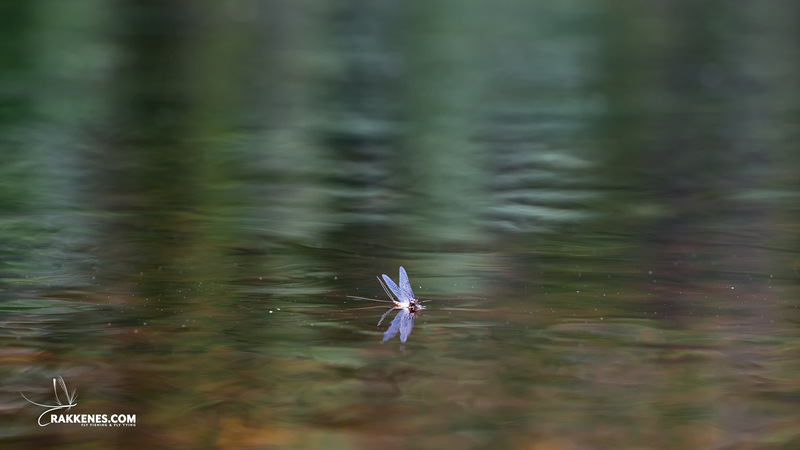 First in late fall/early winter when the nymphs living in shallow water are fleeing sinking water levels and moving into deeper territory. At these moments they are available to feeding fish. The second time is at the time of hatching, when they dig themselves out of the sand and swim to the surface to hatch. It’s pale olive just after hatching, but rapidly changes color to a creamy yellow hue. The abdomen is segmented where the four or five last joints are marked with brown segments. 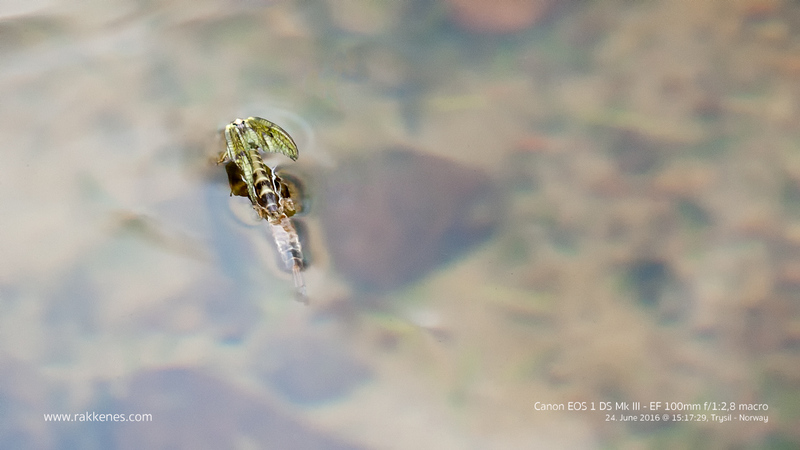 Turn the bug upside-down and you’ll see that there are brown segments all over and up to the thorax. In my waters, the Danica usually hatch from mid/late June and for three or four weeks. 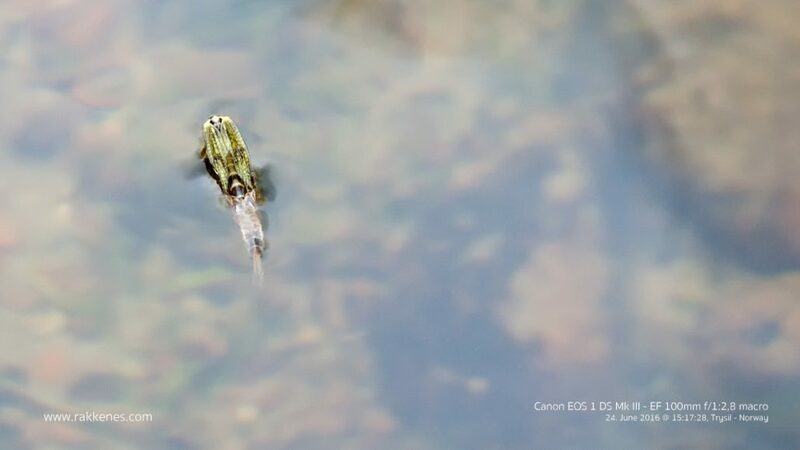 Depending on the water, the Danica is usually quick break-out from the nymph shell. Usually it only takes the emerging nymphs a few seconds to break out of her shuck. Unlike many other species, such as the Baetis or Ephemerellas, the Danica doesn’t refuse a sunny and warm day. In fact, my fly fishing diaries confirm that the best Danica hatches happens under a warm morning or early afternoon sun. I have been kind of pseudo studying the Danica for years. Not scientifically, but merely observing the hatch and taking notes in my diaries. A couple of years ago I took careful notice of the efficiencies of the different imitations. 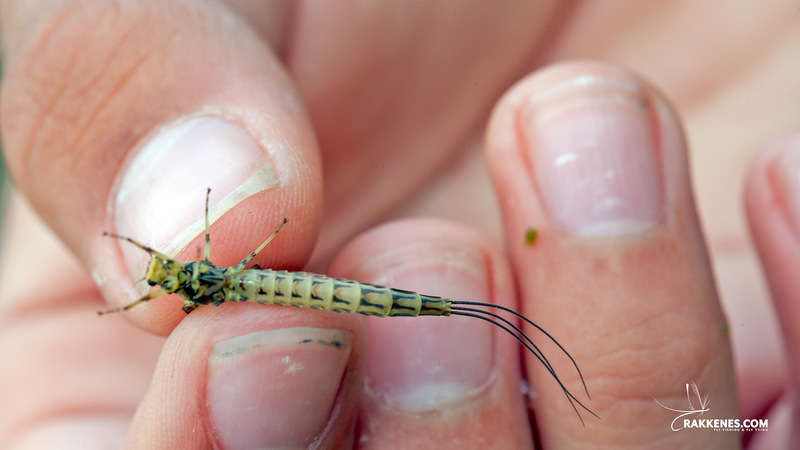 What I found was that the Danica emerger pattern will outfish all other imitations for at least one week into the hatch. 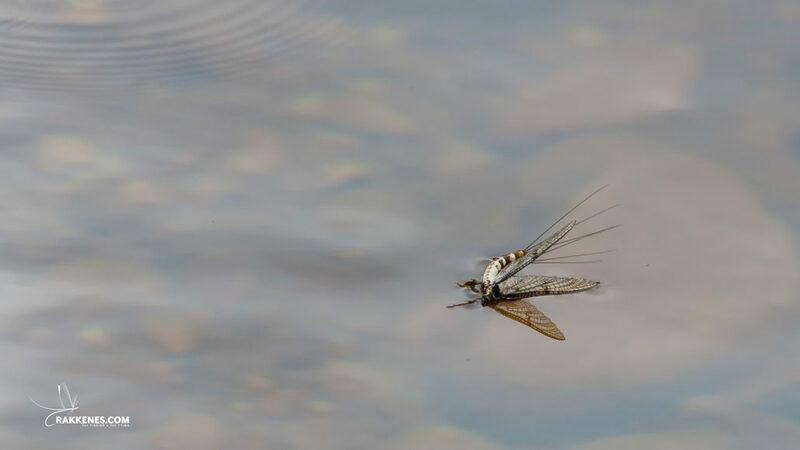 Over the years I have also found that a good dun imitation, such as the Mohican or a simple extended body fly, is all you need fishing both spinner falls and duns. 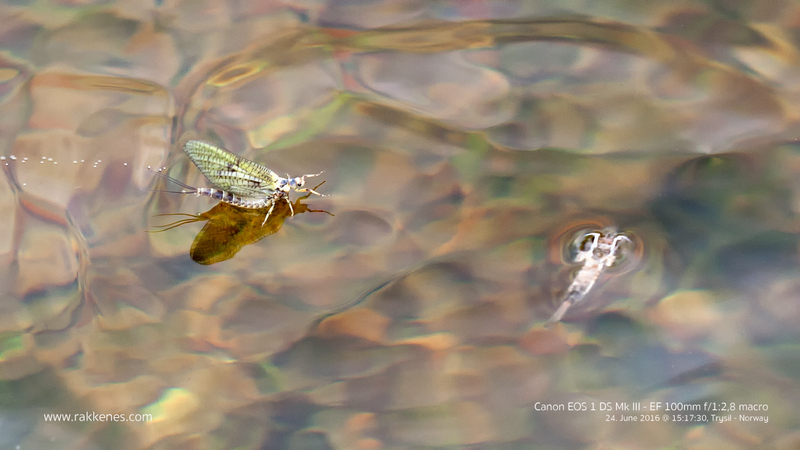 The first week after the hatch cycle has started the emerger pattern is my first choice. The mayfly use some time to break out, and the fish sees the may fly as an easy prey. 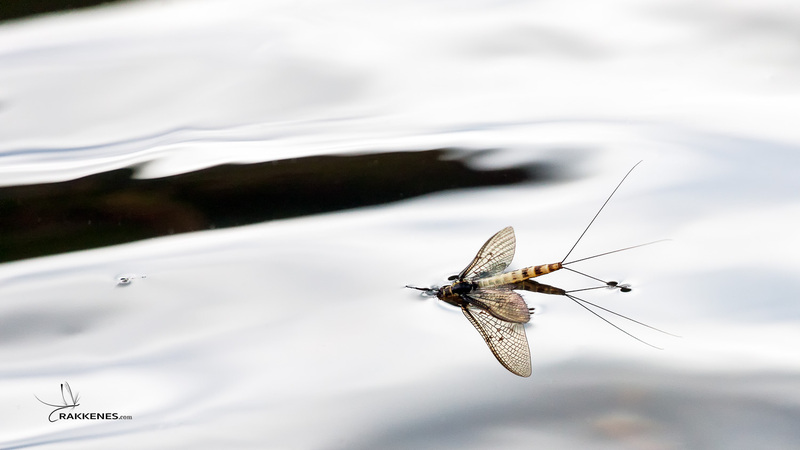 In the start and peak of the hatch cycle, there are simply more nymphs and emergers than duns. Do not exaggerate the size of your Danica. Even if the Danica is up to an inch in size (2,5 cm), you may fish it as small as two centimeters. It does not reduce the attractiveness of your fly, and it gets a hell of a lot easier to cast without messing up your tippet or leader. In my view, the Danica spinner is the most interesting to fish. 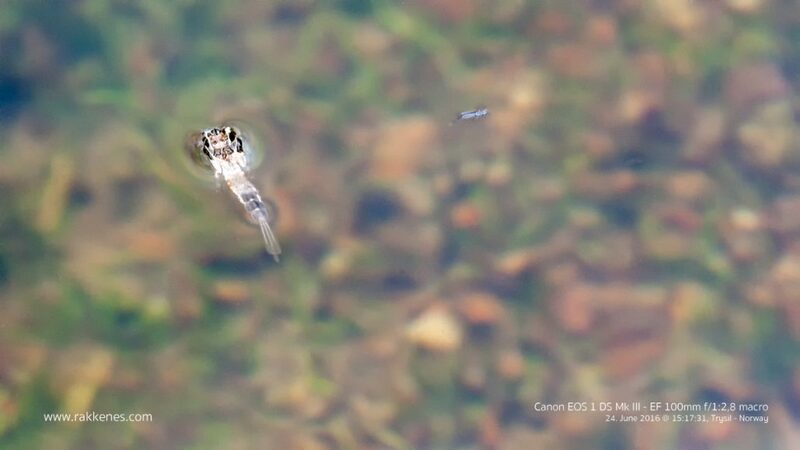 Often it may seem that the trout is not very keen on the newly hatched dun. Either the trout gets fed up, or they simply feed sub surface for nymphs or emergers. But in the evening, when the sun sets, and the air is calm, the Danica returns to the river to lay their eggs. Most of my trophies are caught during the spinner fall. And you don’t need a spent spinner to fish the spinner fall – try a creamy parachute dun pattern. 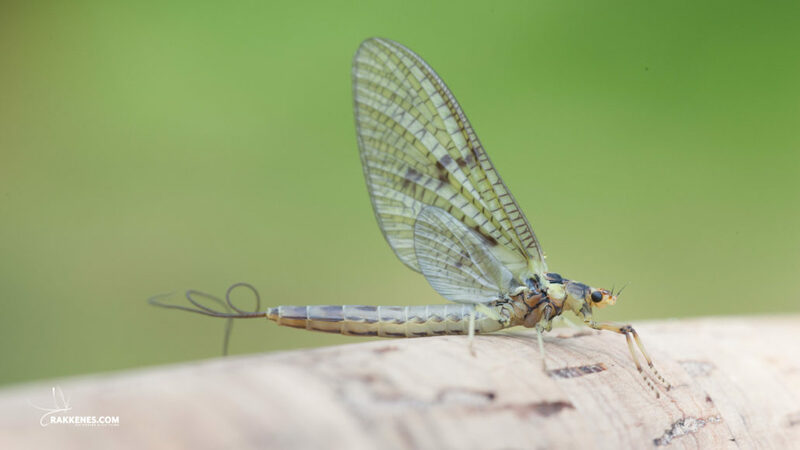 Very often the Danica hatch comes together with other attractive may flies, such as the Dalecarlica or the Sulphurea. When that happens, you should be on your toes. 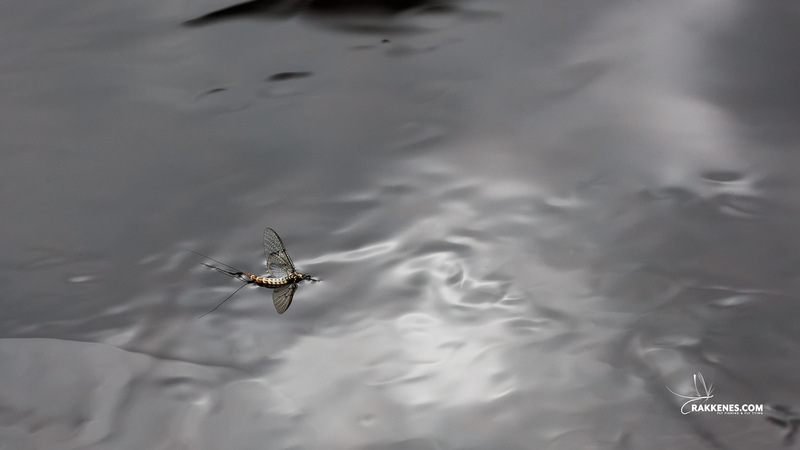 Very often it happens that the trout stop feeding on Danica and choose the fly that outnumbers the Danica on the river. This happens often, and especially in the final stages of the Danica hatch. This phenomenon is well known in literature. Doug Swisher called it the “Concealed Hatch” dilemma in the book “Selective Trout”. 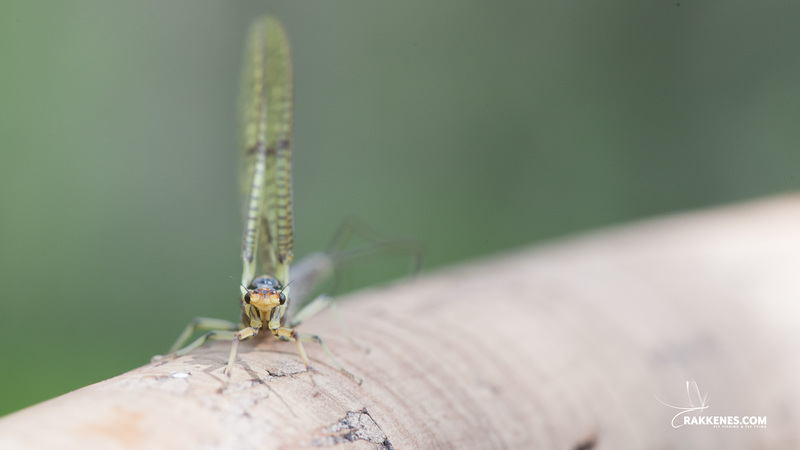 In contrast to other may flies, the Danica does not demand rain and moist weather to hatch. The Danica loves a clear and warm day. The hatch often start around 11 and can last as long as five or six hours into the afternoon. The spinner falls in my waters usually start around 22.00 in the evening. A collection of articles and information on the Ephemera Danica in Norwegian waters. Observations are mostly done in different rivers in Trysil, Norway. A collection of our favorite patterns for fishing the Danica hatch cycle. All patterns are fished and successfully tested in Norwegian waters. We are continously competing our website with photographic and video studies of the insects that makes fly fishing possible. Some of the articles are listed below.